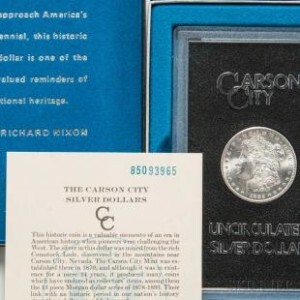 Coins of The Carson City Mint | Skinner Inc.
Carson City Morgan dollars are some of the most iconic coins in American numismatics. 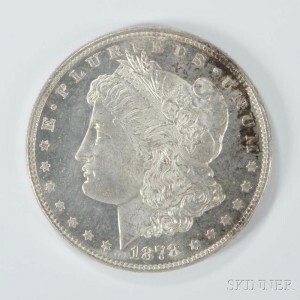 The Morgan dollar series in and of itself is highly collectible, obtaining staggering prices for higher end pieces. However, coins from the Carson City Mint, bearing the “CC” mintmark, have always excited numismatists, especially Morgan collectors. The branch mint produced only thirteen years of Morgan dollars, while the whole series experienced twenty-eight years of issue. Despite the mint’s popularity, its existence was relatively limited, minting coins from 1870 through 1893, with a brief hiatus in between. The Carson City Mint, like the San Francisco Mint and other branch mints of the 19th century, began out of necessity. Carson City’s proximity to the Comstock Lode, the first major silver ore mine in the United States, made it a prime location for silver to be coined and used in the sprouting economies of the west. According to its records, the Carson City Mint coined more than eleven-million Morgan dollars during its thirteen-year run. These coins were considered scarce due to their relatively low mintage and low availability in higher grades. Although quantities of Morgan dollars were released throughout the early 20th century, it wasn’t until an audit of Treasury vaults in the 1960s that their popularity boomed. This discovery and subsequent General Services Administration (GSA) sales of the 70’s shed light on the actual availability, bringing up to 84% of one year’s entire mintage to the market. In total, approximately 2.8 million Carson City Morgan dollars were released to the public, making this seldom seen issue easily obtainable and affordable overnight. Skinner’s Coins & Currency online auction, running from February 9 through February 17 features ten coins from the GSA hoard. These Carson City Morgan dollars are all in uncirculated condition with their original GSA plastic cases and certificates of authenticity, ranging from 1880-1885. See these and other Morgan dollars in the February auction now open for bidding. All coins are available for public preview in Skinner’s Marlborough location on Tuesday, February 14 from 12-5PM and on Wednesday, February 15 from 10AM-7PM. This entry was posted in Blog and tagged antique coins, antique currency, Carson City Mint, coin collecting, coin collector, coins, collectible coins, Comstock Lode, General Services Administration, Morgan Dollar, numismatics, numismatist, online auction, silver ore, skinner, skinner auctions, timed auction by Kyle Johnson. Bookmark the permalink. I purchased a few “CC” Morgans last auction. Interested in Next one-When will catalog be online?? The next auction will be online by Tuesday, August 15. Contact kjohnson@skinnerinc.com with any further questions.